woPad has stopped producing woPad i7 . Now with the lower price, you can get Ainol NOVO 7 Flame , which is 3 generation newer than woPad i7 . 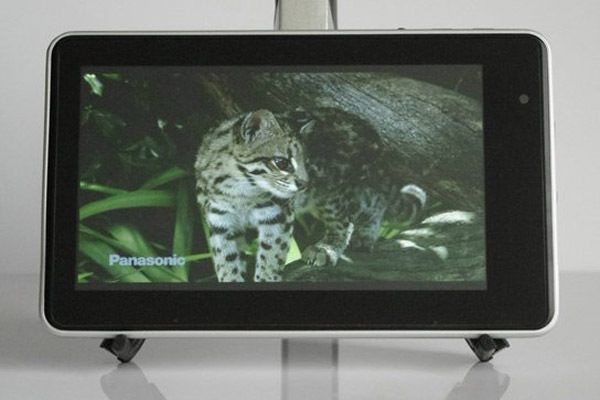 This is the 2nd generation of woPad with 7 inch capacitive multi-touch screen. It runs on the latest Rock-chip 2918 CPU based on ARM Cortex-A8 architecture. 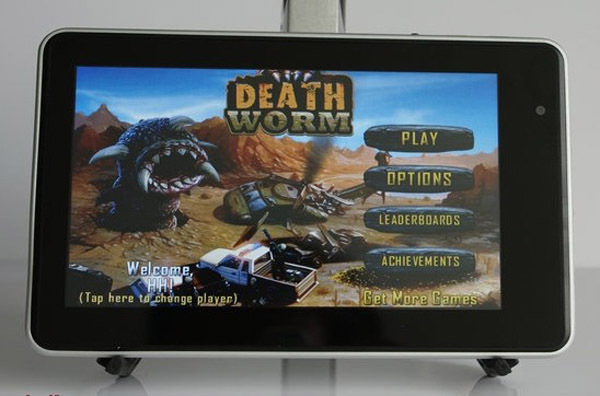 It uses our signature “ iPad ”-like aluminum enclosure that was used in woPad 1, but everything else are upgraded – to name a few, much faster 1.2GH ARM Cortex-A8 CPU, doubled memory to 512 DDR3, runs Android 2.3, supports 3D games with native hardware acceleration, support Skype video calls, supports FLASH, added front-facing camera, and the best of all, it keeps the low price. 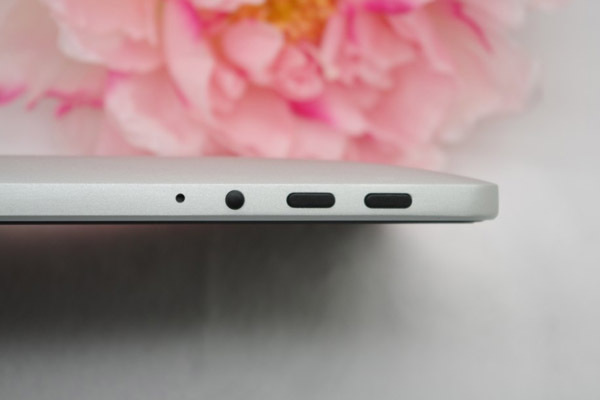 It has aluminum case like iPad 1, giving it really high-end looking. 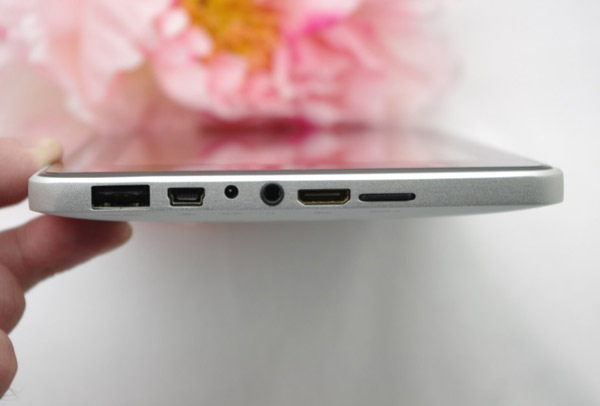 At the bottom you can find standard USB port, mini USB port, AC port, microphone port, HDMI port, and Micro SD Port. The speaker is located at the top right edge. Power button, and Volume up/down button are located on the top left edge. It can play the highly resolution HD video 1080p very smoothly. 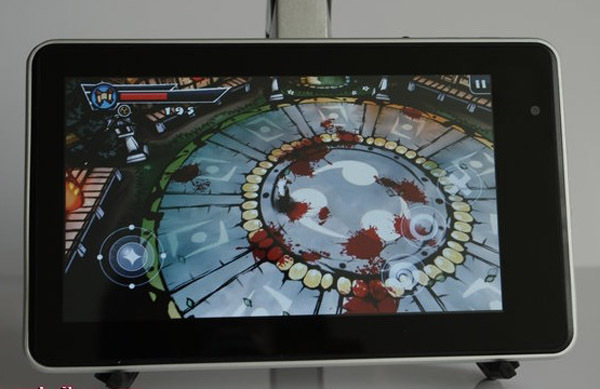 Thanks to its built-in GPU, it plays 3D games nicely. Online chat/video call: QQ, MSN, Skype etc. The WiFi on woPad i7 supports 802.1 b and g, not a and n. So it doesn’t connect to some WiFi routers, for examples, those old Linksys routers. Every woPad i7′s WiFi is tested before shipping , so if it doesn’t work for you WiFi router, it’s a compatibility issue. HDMI output only works for video, cannot mirror tablet screen to your TV screen in other applications. The default language setting is Chinese. You can set it into English. If you do a factory reset, it will go back to Chinese, and you need to set it back to English in the language setting. The user manual is not very helpful. Since the OS is a stock version of Google Android v2.3, you can find plenty of user guide online. Have a question about this tablet ? ask your question here. You will get answer by email. Just got my Wopad i7 in the mail today and even though it's a Christmas present for me, I had to check it out to make sure everything was in working order before I tucked it away for Christmas. It works and is totally awesome. I allowed myself to play with it just a little. :) It was very hard to put it away. The english in the instruction book (which was for a V7) is a bit hard to understand, which I attribute to translation difficulties. The little cover/ keyboard is handy and good protection for the device. Screen is amazing...great resolution and so clear. Love that the back is metal and not plastic. It took about three weeks to get to me by mail from China, which is very reasonable. It often takes longer for items coming to Canada from the US. 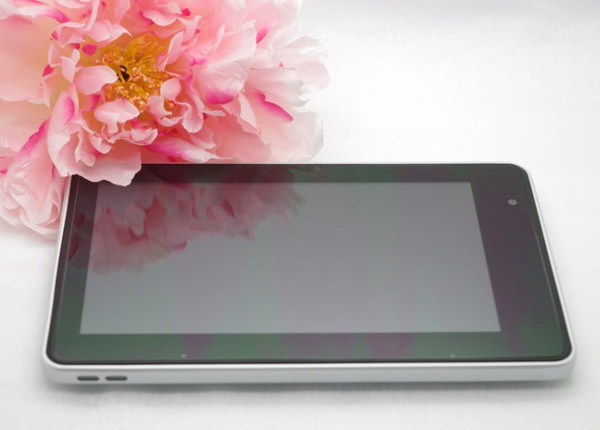 From what I see so far, this is exactly the tablet that I was looking for. Research into the various tablets out there always pays off. My research led me to this one and I know I'm going to be thrilled with it. 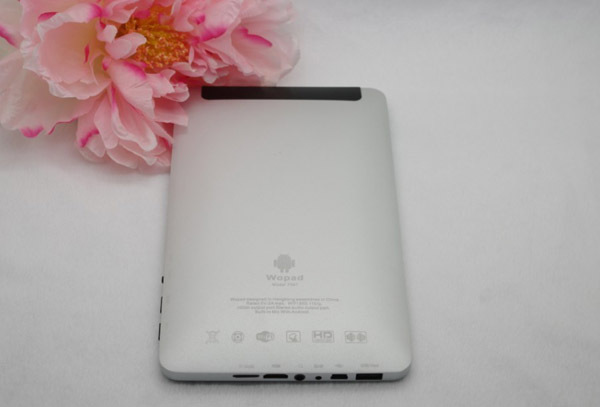 This tablet is a very nice product and I would recommend it for someone looking for a nice quality tablet with a great screen. touch sensitivity is fantastic ans the processor is fast. Highly recommended. Packaging – Nice… looks professional :), sweet color graphics on the box. Although the picture of the tablet on the top of the box is a different device lol… Overall a plus though. It is a little bit bigger than the RENA3 all around. Same width, slightly thicker (although I will comment on this in a moment), slightly taller. Despite being a little bit thicker than the RENA3, it actually feels thinner in the hand because of the shape of the device. This is a plus. Also, the back IS NOT PLASTIC… At least it sure doesn’t feel like plastic. It is extremely rigid and it isn’t glossy. This is a HUGE plus and the main reason it earns 3 of its 3 stars on the physical… Speaker placement is good, hands don’t block them when holding the device and the mesh grilles look nice. b. Buttons – Across the top – Power, Menu, Back… I would knock a partial star off for NOT having physical volume keys but I am already docking enough points in the next section and some would argue that physical volume keys are a personal preference. Anyhow, I wish they were there, but they aren’t. I also wish the back button was on the front face like pretty much every other android device. It is annoying in that it is on the top edge but, oh well. The buttons all “feel” good and are fairly solid. I think I will eventually get used to the placement of the back button and it won’t be that big of a deal. This setup IS probably preferable to the UBER sensitive capacitive buttons on the front of the RENA3. 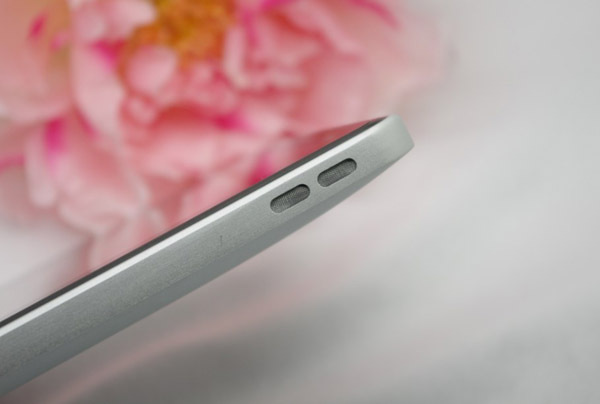 c. Overall Build Quality – Here is why it isn’t a 4.5-star… The front face of the device doesn’t feel extremely “secure” with the back aluminum shell. It feel just a tiny tiny bit loose. So, slightly cheap feel on the front… If I “try” to “bend” the device the front face will start to come up at one of the corners… Not COOL… I should note that this only happens if you are actually trying to bend the device… but it isn’t taking much pressure. I worry that if I were to say… drop the device from 2 or 3 feet up (like off of my kitchen table) and a corner of it hit the ground that the front face would “pop out” I am only docking 1.5 stars for this as the device overall looks and feels good… But it is obvious that build quality could have been a little bit better… perhaps super glue or stronger plastic snaps would have helped? But then it is probably easy to get into so that might be a plus for the hacking community. Performance – WOOT! 5 Stars – First thing I noticed… Decently QUICK boot-up. Like 25 – 40 seconds max. WAY BETTER than the 90 seconds on my previous RK2918 device. This is a HUGE positive as it makes the device much more usable all around. 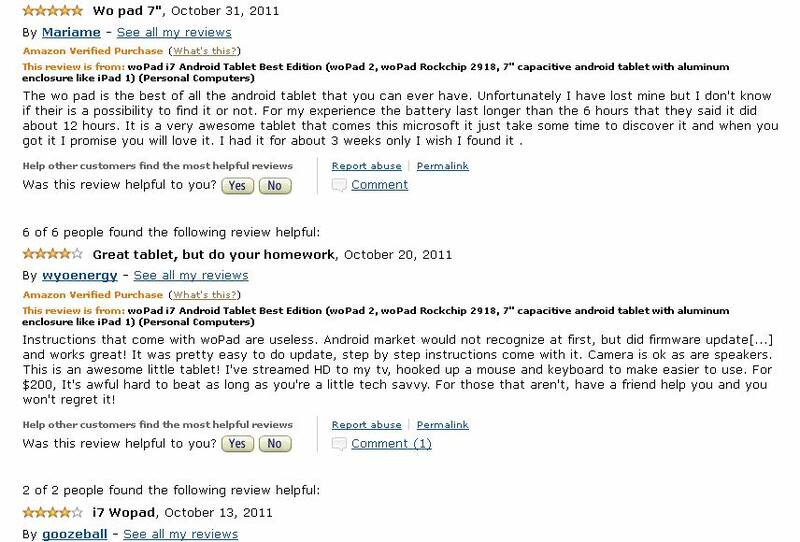 Touchscreen response is EXCELLENT. Easily as good as the RENA3. The Android UI is ridiculously smooth. I haven’t had much time to test internet browsing yet but I have high hopes based on the phenomenal UI experience. This is what I expected from the first RK2918 device I had but it just didn’t quite deliver… I did try out heavy gunner. (I ran into an odd issue with the keyboard where the “enter” key disappeared and was replaced by a smiley key… this kept me from getting into heavy gunner which also has the poor design of requiring you to enter a name into a box that has no “okay” button under it to confirm. So without an enter key on my keyboard and without an okay key in the game I was literraly stuck and had to force a device reboot lol, I replaced the built-in keyboard and this fixed the issue) Heavy Gunner is PHENOMENAL on this device. It is fast, responsive and the graphics look great. I will discuss this further in another section. I *might have to lower this slightly after playing with web browsing some more. That was a BIG complaint I had against the other RK2918 device. Web browsing was NOT as smooth as it could be. This was web page loading speeds AND scrolling/pinch-to-zoom. I haven’t used this device enough yet to say yay or nay yet though. The one or two pages that I did look at felt better than how things were on my last RK2918 device but they did not feel as smooth as the RENA3. WiFi has been pretty good today. To clarify it is WiFi “N” not just “G”. It says this explicitly on the back of the device. This is really good news as I run an “N – Only” network at my house. I was thinking I was going to have to slow the whole network down by changing back to mixed mode while I tested this device. Very nice surprise. It connected quickly with my Network. I think I get almost exactly the same signal strength and distance as the RENA3, which I have always considered decent. I live in a 2 bedroom apartment though, so other folk’s use may vary. The real test is if I can sit outside and still get a signal. Which I can. It is feint, but it stays connected and I can skim the internet. I know this is all very subjective but I think I can say with a fair bit of assurance that most people won’t be disappointed by the WiFi. Boot times were MUCH slower today. Like around 70 Seconds. This is very noticeable when put next to the RENA3 which boots in roughly 20 seconds. I hit the power buttons on both at the same time, the RENA3 boots much faster. I am not sure why the increase in boot times? Perhaps because I have added an 8gb SD card and installed some apps? This also is why i am docking half a star.